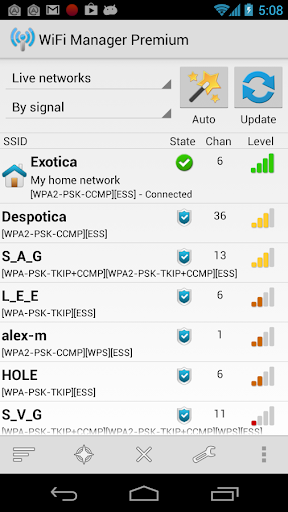 WiFi Manager v4.1.7-187 Premium APK – Find, connect, manage WiFi networks. Improve connection quality with a graphical channel radar. Discover open networks around you. Can scan for and switch to the best network out of several configured. Some features require that you purchase the $1.75 premium package, available right in the application through Google Checkout (safe, secure). These features are: advanced per-network options (description, icon, IP address), the one-tap network widget, and two widget themes inspired by Android 4.0. 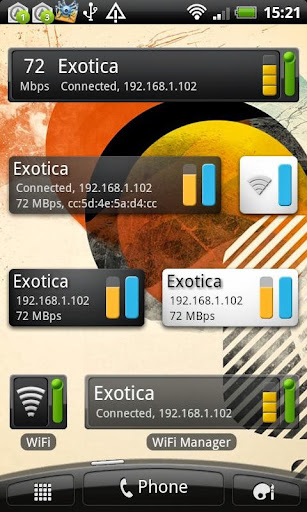 All the other – essential – features are free: the widget with detailed connection info (four sizes, two free themes), scanning and connecting to networks, the network list view, the network signal radar. Orders are processed and saved by Google and can be reactivated after a phone reset / flash, or on a new phone. “Change system settings” is needed to switch between fixed and dynamic IP addresses, if configured so. “Prevent phone from sleeping” is needed so you can enable automatic scanning and discover open networks around you. “Market billing service” is needed to make purchases. – Backup and restore of per-network descriptions and icons to / from a file. In the menu. Had to add the “storage” permission.